Concord, NH – Today, the Senate passed a bill, SB 466-FN, which would authorize minors detained while waiting for disposition of their case to be housed at the Sununu Youth Services Center. Senator Sharon Carson (R-Londonderry) issued a statement upon passage of this bill. Concord, NH -The Senate today passed a bill, SB 465, establishing a penalty for the dissemination of private sexual images without prior consent. 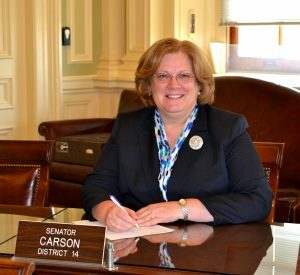 Senator Sharon Carson (R-Londonderry) issued a statement upon passage of the bill.